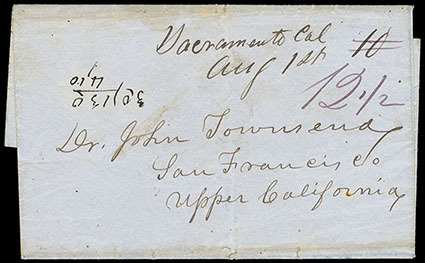 Sacramento Cal, Aug 1st, manuscript postmark and manuscript "10" rate marking on folded letter sheet (no contents) to pioneer physician Dr. John Townsend in San Francisco "Upper California," purple manuscript "12½" rate correction applied in San Francisco, necessarily an 1849 use given the manuscript postmark and so the earliest known Sacramento postmark, small arithmetic doodle, minor edge wear and light edge toning, Very Fine. 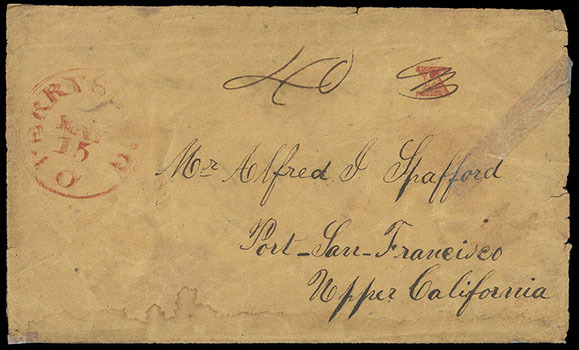 The 10¢ rate was the 1845 rate for a half ounce letter sent over 300 miles or a one ounce letter sent under 300 miles. The basic 1847-1848 Pacific Coast rates were 40¢ per half ounce between the West and the East and the peculiar amount of 12½¢ per half ounce between points in the West. Perhaps the newly appointed postmaster at Sacramento was familiar with the old rates and found the new ones confusing. 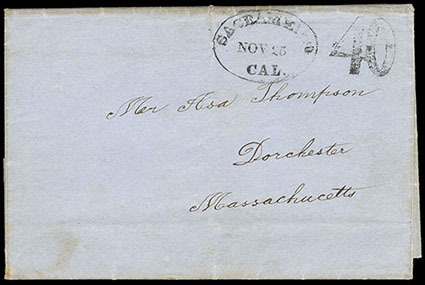 Sacramento manuscript postmarks are known used from August 1 (this cover) to October 18, 1849, with 12 examples recorded. Dr. John Townsend came overland to California in 1844 and eventually settled in San Francisco where he practiced medicine. Townsend Street in San Francisco is named for him. Sacramento City, August 1st 1849, heading on folded letter mailed a month later with "San Francisco, Cal., Sep 1" large cds and purple manuscript "40" rate marking, also with "Sacramento City" endorsement in the sender's handwriting, letter (2 pages) is from a man newly arrived "at the Dry Diggings" to his brother in Belleville, Illinois, the body of the letter is comprised of an account of hardships on the overland trail to California along with a list of prices current, the writer mentions in between "I am going to work tomorrow and will make 15 dollars a day. Gold is plenty everywhere and I am going to make it and save it… write to me at San Francisco," minor edge wear, bleach spots, stamp hinge reinforcements on the back of the address panel, F.-V.F., ex-Newton. Dry Diggings was an early name for Placerville as well as some other towns where late summer water levels dropped too low for placer mining. Sacramento Sep 5 - Paid 80, manuscript postmark and rate marking on turned cover to Perrysburg, Ohio, cover originally sent from there with red cds and manuscript "40" rate marking to "Port San Francisco, Upper California", some wear & flaws, Fine and rare, the only recorded Sacramento manuscript postmark showing the 80¢ double rate. 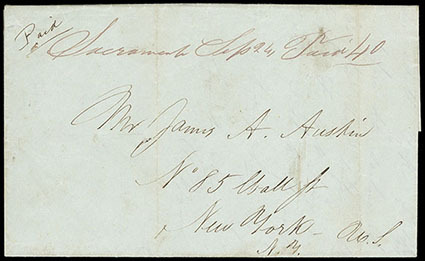 Sacramento Sep 24, Paid 40, manuscript postmark and rate marking on folded letter to New York City, also "Paid" sender's endorsement, letter (1-½ pages) is headed "Sacramento City Sept 24th 1849" and from a man to his brother, letter notes "the Steamer Oregon has arrived at San F. but brings no mail, she waited three weeks for it," the writer also states he is a partner in a "hole" at Smith's Bar that yielded four hundred dollars worth of gold dust after a few days of work, Extremely Fine, one of the finest examples of the Sacramento, Cal. 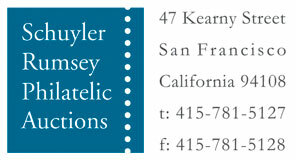 manuscript postmarks. 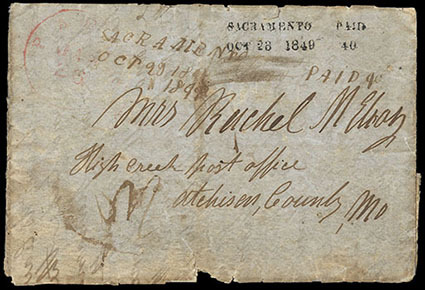 Sacramento / Oct 23 1849 / Paid / 40, straightline postmark with integral rate marking on folded letter sheet (incomplete contents) to High Creek, Missouri, with red Paris, Missouri, transit postmark, edge faults and fragile with tape reinforcements, some extraneous writing, soiled, Fine, Sacramento straightline postmarks were used intermittently for only three weeks. Sacramento straightline postmarks are known used from October 21 to November 10, 1849, with 8 examples recorded. Sacramento oval postmarks were used concurrently. 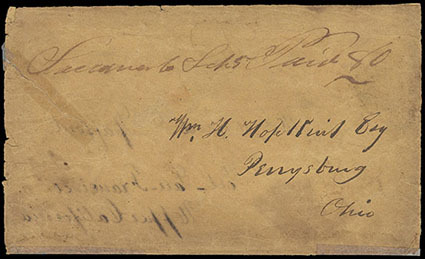 Sacramento / Oct 24 1849 / Paid / 40, straightline postmark with integral rate marking on folded letter to Yellow Spring, Iowa, "family" pencil docket, letter (3-1/2 pages) is from a 49er to his brother back home and datelined "Cold Spring, Weaver Creek, Cal. Oct. 21st '49", letter reads in part "I have not received an answer to any of the letters that I have written… The fault is in the mail I know… is said the two last steamers failed to bring letters on account of the mail not having arrived at the Isthmus… after digging some three or four hundred dol. where we first stopped, we packed up our mules and went to the Middle Fork…Spent three weeks damming the river, was lost labor there was no gold in the channel of any consequence… Came back to the same bar that we left and went to work, the water having raised some, have worked about one month made four hundred dol. each and expenses… intend going south in a few days thinking it will be pleasanter wintering there…I wish you could see… Gallowstown … with its thousand men at work digging up what had been streets to the depth of 10ft scooping the gold from the surface of the permanent rock… men don't generally dig on Sunday, they only build houses", Extremely Fine and choice, a choice strike of a rare postmark, ex-Parker and Kramer; with 1981 P.F. certificate. THIS IS THE FINEST KNOWN STRIKE OF THIS VERY RARE CALIFORNIA STRAIGHT LINE POSTMARK. Gallowstown may refer to Hangtown, which was an early name for Placerville after three men convicted of robbery and murder were hanged there. Sacramento, Cal., 40, Nov 1, oval postmark with integral rate on folded letter to Tecumseh, Michigan, letter (3 pages) is from a '49er to a friend back home and datelined "Feather River in camp Oct 7th 1849," letter includes a brief account of the writer's overland journey to California and ""every man that comes here and makes money makes it by industry, perseverance and economy… the water passages are all taken for at least 30 days ahead to carry back those that are not needed… We have concluded to stay here for the present and try our fortune among the hundreds that are doing the same. Within 80 rods of us there are men not making even $5.00 per day, and then there is a company of 5 men that are clearing from $800. to $1800. per day, and about the towns there are thousands that are sitting around doing nothing spending what they have earned before… I have worked about 3 days 3 of us and we have got in… $80. worth at $16. per ounce", Extremely Fine and singularly rare, the only Sacramento oval postmark with integral rate available to collectors. 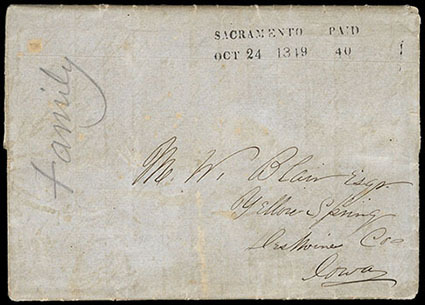 Sacramento oval postmarks with integral rate are known used from October 31 to November 10, 1849, with only 3 examples recorded. 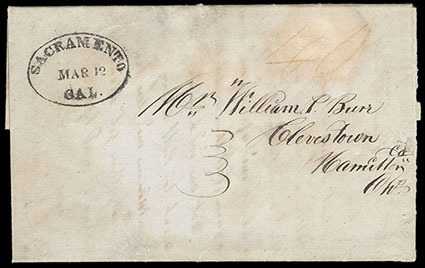 Sacramento oval postmarks without integral rate were used concurrently. Of the 3 examples with integral rate, 2 reside in institutional holdings that are unlikely to ever be sold. Sacramento, Cal., Nov 25, oval postmark with tall "40" rate handstamp on folded letter to Dorchester, Massachusetts, letter (1 page) is from a man to his parents back home and datelined "California Gold Mines November 20th /49" and mentions the North Fork of the American River, letter reads in part "we have a log house and provisions enough to last us until next May… I have not worked in the mines yet… some are doing better than others they are making from ten to fifty dollars a day. I have been offered twelve dollars a day and board", Very Fine. Sacramento, Cal., Mar 12, oval postmark with manuscript "40" rate marking in red pencil or possibly ink on folded letter to Cleves (town), Ohio, letter (3 pages) is from a miner to a friend back home and datelined "March the 1, 1850, North Fork of the American River California", letter notes "the steamers is so irregular that there is no telling whether letters comes or goes 'tho they are getting better", the body of the letter describes the sender's overland journey to California and the vagaries of placer mining in the diggings, but the handwriting is difficult to read and the paper has been cleaned leaving several bleach spots including one affecting the rate marking, F.-V.F. 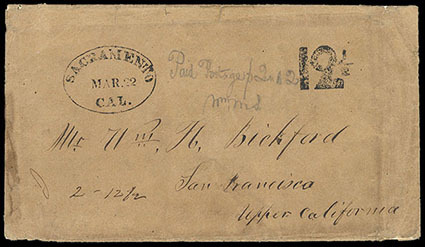 Sacramento, Cal., Mar 22, oval postmark with tall "12½" rate handstamp on cover to San Francisco "Upper California", also odd" "Paid Postage 12½, Wm. M. S."" pencil notation evidently meant to denote prepayment of the one bit rate, "Recd May 26 /50" docket on the back, edge wear and an edge stain, a couple small doodles, card reinforcement affixed inside the cover, Fine. Sacramento oval postmarks without integral rate are known used from October 31, 1949, to April 24, 1850, with 51 examples recorded. Within that group, 10 examples of the tall rate handstamp with the 12½c rate are recorded.